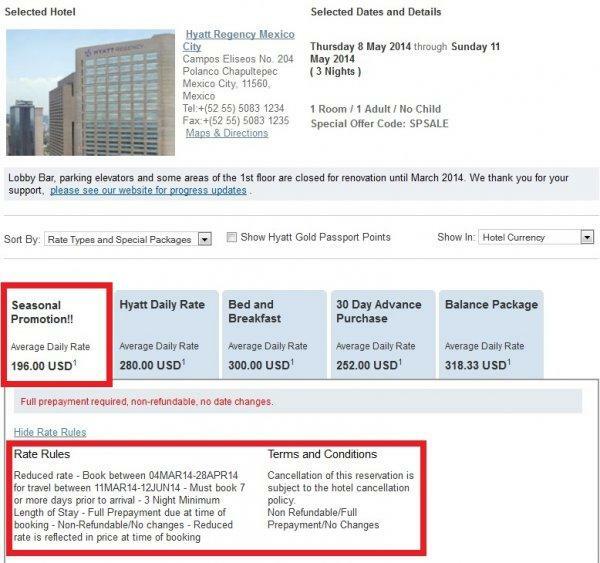 Hyatt is having “Seasonal Save” at participating properties in the Americas for stays until June 12, 2014, that are booked by April 28. The minimum stay is 2 to 3 nights and the discount amount varies from 20% to 30%. You can access Hyatt’s web page for this sale here and you must remember to use offer code SPSALE to access the discounted rates. Note that this rate is prepaid, noncancelable and nonrefundale. You should only book it if your plans are firm. This is now the second time Hyatt has this Americas Seasonal Sale. You should check the rate against other rate offers if you have stays coming up at the participating properties during the period. Offer valid for bookings only between 12:01a.m. on 3/4/2014 to 11:59 p.m. on 4/28/2014 Central Time for stays from 3/11/2014 to 6/12/2014 at participating Hyatt hotels and resorts. Reservations are subject to availability and must be made at least 7 days in advance of arrival. Full non-refundable prepayment required at time of booking. Offer is for a limited time only. Request offer code SPSALE when you book your reservation and pay the Spring Promotion / Seasonal Sale rate. This offer rate reflects a discount off the Hyatt Daily Rate for the room type requested at time of booking. Rate is per room, per night, excluding service charges, taxes and other incidental expenses. Rate is based on double occupancy. Additional charges may apply for additional guests and room-type upgrades. A limited number of rooms are allocated to this promotion. No changes, amendments or cancellations allowed. Changing to a different property is considered a cancellation. Canceled reservations and no shows will forfeit the full prepayment. Promotional blackout periods may apply due to seasonal periods or special events, and normal arrival/departure restrictions apply, including, but not limited to, minimum length of stay and day of week restrictions. Offer may not be combined with other offers or discounts. Hyatt reserves the right to alter or withdraw this offer at any time without notice.